Now that Easter is about two weeks away, I thought I'd share what I decided to do for Lent. Since I hesitated to write this post in the first place, I will preface with: this post is not to brag about what I decided to give up for Lent as that is not the point but it is to share my thoughts and what I've learned so far this Lent. I do believe in doing something for Lent (that is not easy to do) but not for the sake of just choosing something to give up for Lent. It doesn't have to be giving up sweets or alcohol or something material. It could be giving up lying, gossip or negativity. Or it could be taking up something positive during Lent like volunteering or daily acts of kindness, etc. The purpose is to be more attentive to God and also remember the ultimate sacrifice he made for us, Jesus. It is a great time of year to strengthen your faith and focus with Easter right around the corner. For Lent, Eric and I also decided together to read Beyond Ordinary. 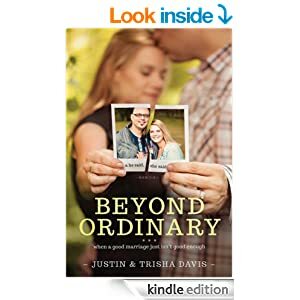 This is a marriage book about going beyond an ordinary marriage (as the title suggests) to have an extraordinary marriage that is the type of marriage God envisions for us (sounds awesome right?). One that asks what I can do for the other person and not what the other person can do for me. And how to steer away from thoughts and behaviors that can make your marriage just ordinary. It is written by two youth pastors about their marriage and faith journey full of ups and downs on their path to an extraordinary marriage. The book has parts written with the voice of the wife and the husband, great for out-loud reading... yes we read to each other. It also has questions to think about and apply to your own life at the end of each chapter. It is not your typical marriage book... like those ones that say here are the keys to a great marriage or to understanding your spouse or to communicating better, etc. etc. It is a real story and exposes what a real marriage journey was for these two. My friend Katie recommended this book to me and while we are not finished with the book yet, I can already say I'd recommend it to anyone in a marriage or serious relationship. Has it been easy to give up shopping during Lent? Well of course not but if it was something easy to give up then it wouldn't be a sacrifice. I made sure to route all shopping emails that I receive into a different folder that I can ignore since they are not in my inbox. And not having new items in my closet has enabled me to be more creative and rework the items in my closet. It has caused me to really rethink clothes shopping and the clothes I wear as a whole too. In decor shopping, it was definitely hard not to make a weekly trip to Marshalls or HomeGoods to see what they had new that I might need for our home. But I also didn't have that feeling of disappointment each time when they didn't have that perfect lamp/rug/vase/etc. that I'd been looking for week after week. Please tell me other shopping fans know this feeling? So it has been surprisingly refreshing to not focus on that for a little bit and know that decorating our home is truly a process and takes time... a lot of time and that is okay. Did you give up or do anything different during Lent? Did it teach you anything surprising? This is the first year I have given up something (shopping) and also decided to do something positive (the book) at the same time and it was nice to pair the two together. Do you think the book would be good for those who aren't religious, too? Hi Miranda, I am not sure how much someone who is not religious would benefit from this book since it is centered around the type of relationship and intimacy God desires you to have with Him and with each other in a marriage. Maybe read the description and some of the reviews on Amazon too to see what you think.